The Bet Angel Guardian ‘Watch List’ enables you to quickly and easily view multiple markets across multiple sports at a glance. Create your own 'Watch List' and add all sports or markets of interest or just select just a few to easily keep your eye on what is happening across all markets, quickly and easily with this great tool. Create one main watch list, or separate lists for multiple sports such as Racing, Football, Tennis. 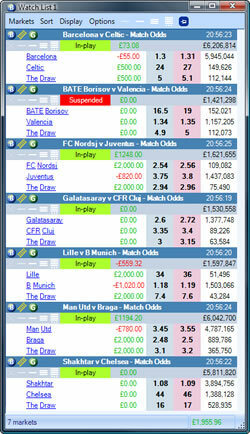 Or why not create a list as a subset of one market, for example Football with match odds, correct score, over / unders etc. Prices are updated dynamically and focus is switched if you move your mouse over any market. Individual and overall profit totals update continuously across all selected markets and you can green up straight from the tool. Think of this as your own personal coupon or 'post-it' note of markets. You choose which sports events are in the watch list. Or quickly add all events contained in Bet Angel Guardian. 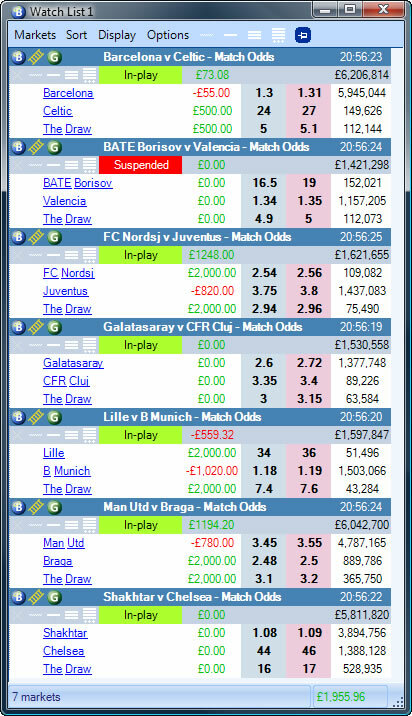 This powerful feature will make managing multiple markets before the off or in-play a breeze. See this video to watch this great feature in use.